IFAD and the European Space Agency (ESA) have just launched a report discussing the use of Earth Observation technology (EO) facilitating project design and increased detail in mapping information to aid people experiencing climate challenges. 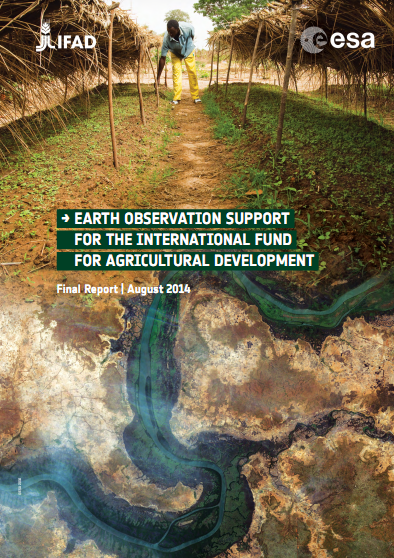 Earth Observation Support for the International Fund for Agricultural Development highlights the 'first results of the European Space Agency's funded pilot projects with IFAD, which demonstrate how Earth Observation (EO) technology can be put to use in the context of IFAD programmes and projects'. The report looks at five projects where this technology has been used and expounds on the advantages of having specific detailed geospatial information for these IFAD project areas. Not only does it provide a simple picture from above, it also offers useful insights and specific information for IFAD's work with rural communities'. IFAD's Adaptation for Smallholder Agriculture Programme (ASAP), the largest climate change adaptation programme for smallholder farmers globally, has benefited considerably from the use of EO information. Especially when used as an input layer for further spatial analysis in a Geographic Information Systems (GIS). This information has helped IFAD 'better understand and monitor landscape use in a changing environment' which in turn informs IFAD's understanding of project design and analysis to create more suitable and sustainable initiatives. The five projects have demonstrated how reliable EO used with GIS can augment IFAD activities, not just with more incisive programming but also within individual operating countries. It is part of a system to train operatives locally so the information generated can be used to its greatest potential. We look forward to a continued partnership with the ESA in developing usage of satellite technology 'across an increased number of IFAD projects to eradicate hunger and poverty in rural areas of developing countries', said Elwyn Grainger-Jones, Director, Environment and Climate Division, IFAD.